You can use root beer, Coke or experiment with other sodas. Or simply take an empty can and create your own flavored liquid. For example, squeeze mandarin oranges and drop them in the can and top with water to 3/4 full. Or add a combination of lemon juice, herbs and some water. Wet Rub: Mix all together the olive oil, thyme, rosemary, sage, a bit of salt and pepper; and garlic. Rub all over the chicken. Dry Rub: Mix all together the paprika, kosher salt, pepper onion salt, pepper, white sugar and brown sugar. Rub the chicken with a bit of olive oil and then coat the chicken with the dry rub. Preheat your oven to 375 or 190.6°C You may have to remove the second rack in your oven and move the other rack lower, so that the chicken will fit in while standing upright. In a large bowl, apply your rub of choice all over the chicken. Rub under the wings, legs, and even inside of cavities. Leave the chicken in the bowl until you are ready to place it on your can. Place the can on a baking sheet or oven-safe griddle. Place the chicken over the can. Open the rear cavity of the chicken and carefully place it over the can, so only about an inch of the can is showing. 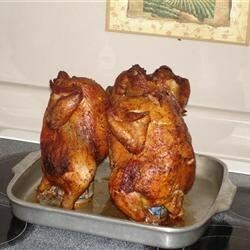 Place the chicken in the oven and roast to an internal temperature of 165 or 73.9°C Depending on the size of your chicken, this can take about 75-90 minutes or so. Once the chicken has reached the appropriate internal temperature, let it rest for about 10-15 minutes before serving.